Just recently I have experimented with resin and casting my steampunk pen blanks. Now having found a resin that is good and easy to work with lots more are to follow with all the different opportunities this opens. Being able to make my colour schemes for pens or customer requests, able to cast blanks to expand the novelty pens like Steampunk or watch part pens and hybrid wooden pens will be a real boon. 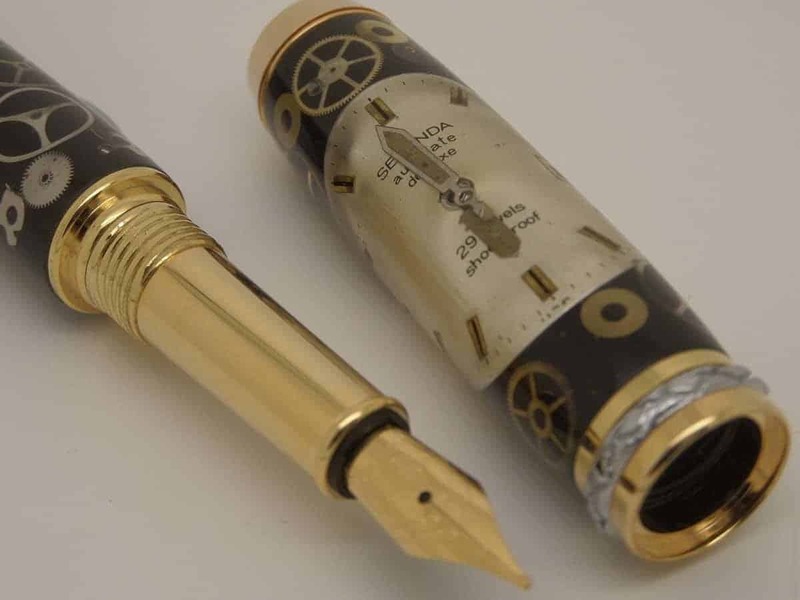 The Steampunk pen is labour intensive to make, sourcing watch parts or broken watches, stripping the watches of usable parts. The base metal work on the pen barrels with all the little details of rivet holes to make and the cogs and other small parts need gluing on, then to cast the tubes in resin before all the normal pen turning work can happen. 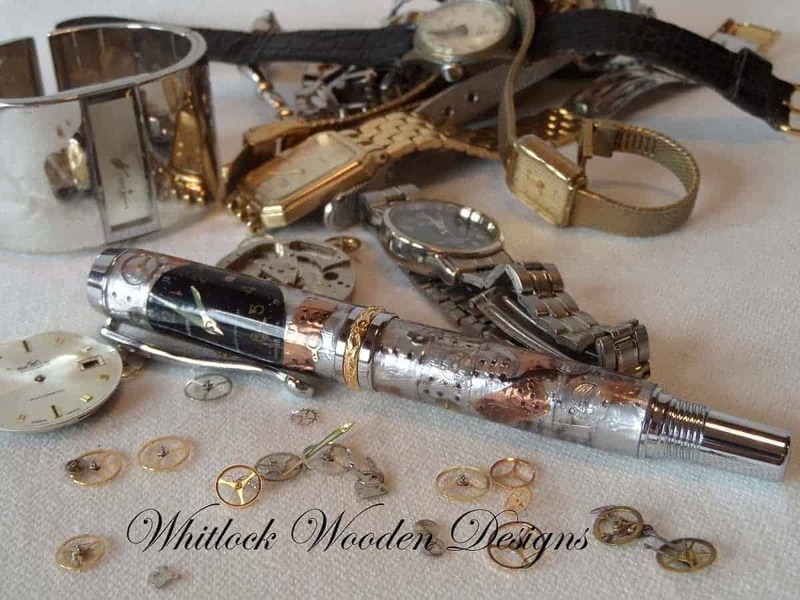 Once finished, this Steampunk watch parts executive Rollerball pen is just stunning. 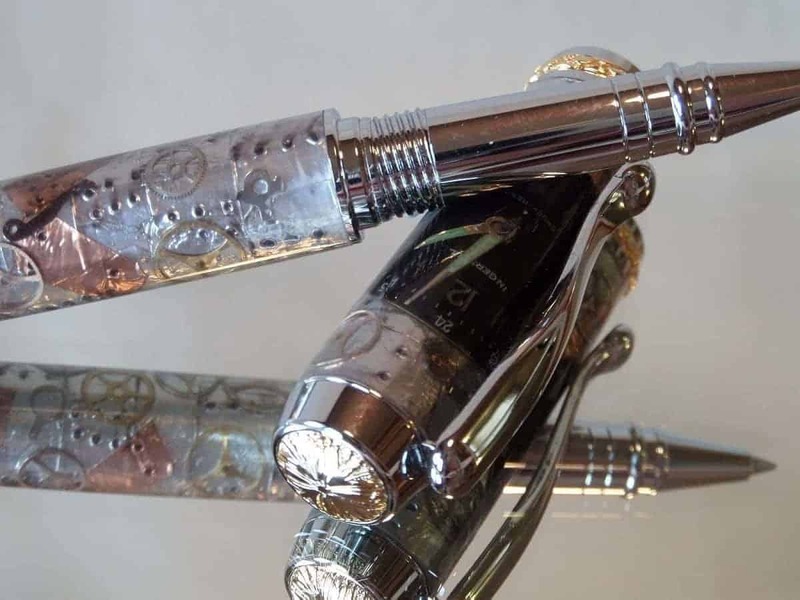 Above is a close-up shot showing some of the pens finer details. Another pen is ready to cast, but with some alterations to the mould needed first, this will follow in a week or two. Update, the second pen was a watch parts fountain pen with a completely different look. Also, this week I have a new monochrome custom safety razor handle to go alongside the custom Mach 3 razor handles. The chrome hardware does make this stand out and just in time for anyone stuck for Father’s Day gift ideas. Along with the other things to cast above, a new line of badger shaving brushes is in the pipeline. Finally, the range of Bella executive pens with its stylish design and a higher quality rhodium plating will be expanding. 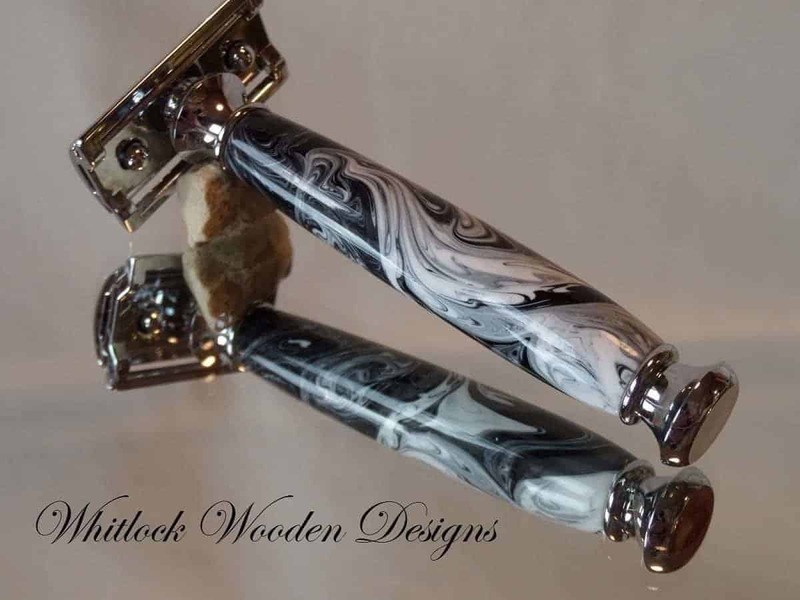 Here are two more to be going on with, first a Myrtle burr ballpoint pen. 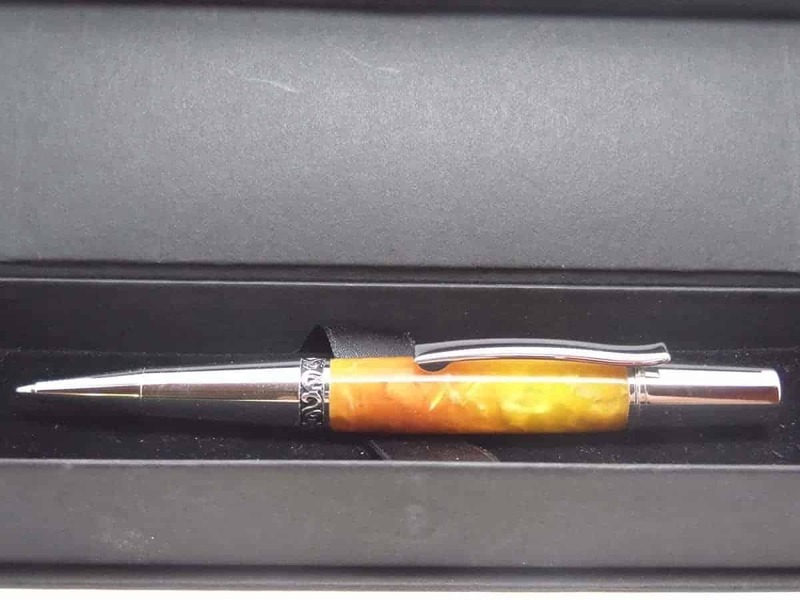 and second a Bella ballpoint pen with the barrel designed to look like the long island iced tea drink it even has the crushed ice effect. All these high-quality Bella design pens use a Parker G2 style refill available from my pen shop. Parker refills offer a wider range of coloured inks and different types available in any of the high street stationery shops. To keep up to date on the wooden crafts and latest designs and makes please follow me on any of the social media channels, or sign up for the newsletter.